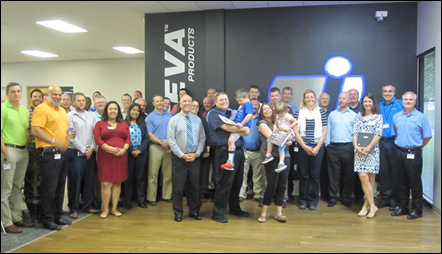 July 2017 - ​Inteva Vandalia Technical Center employees recently presented a $2,400 donation to the Make-A-Wish Foundation. This employee donation allowed five-year-old Paul and his family to go to Walt Disney World and Universal Studios in Orlando, Florida. In addition to the generous donation, Vandalia hosted a pancake breakfast in Paul’s honor to provide even more funds to grant his wish. Paul is battling Duchenne Muscular Dystrophy (DMD). DMD is a genetic disorder that causes progressive degeneration of the muscles. Every Friday, the Vandalia Team participates in a weekly “Giving Day” by donating $1 to wear jeans. Each month, a different charity is selected to donate the money to and occasionally throughout the year, a larger donation is made to fund special charities. Granting Paul's wish will provide hope, strength and joy to Paul and his family. Thank you to the employees in Vandalia for making a difference within your local community.